Andrew and Maree Palmer have had a hand in developing many generations of daughter proven sires. Today, they’re still part of the herd improvement company’s progeny testing programme and reckon they’re doing their bit to strengthen the value of the national dairy herd. The progeny testing programme involves a group of farmers using the genetics of young genomically selected sires for their matings. CRV Ambreed then closely monitors the progeny (daughters) of the young sires through herd testing and TOP inspections to determine which sires will offer the best genetic gain to dairy farmers in New Zealand and overseas. 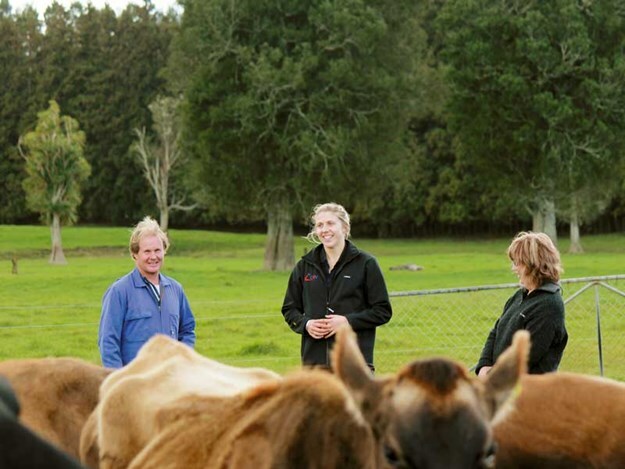 Andrew and Maree own an 82-hectare farm in Opoutere on the Coromandel Peninsula and currently milk 240 Jerseys, all of which have been bred with progeny testing genetics. When their first lot of heifers from the programme came into the herd in 1997, Andrew says he knew he was onto something good. "Seeing the herd quality, the TOP inspector left behind an entry form for the Royal Agricultural Society Dairy heifer competition and we ended up winning the sire-proving division that year," Andrew says. "It gave me a confidence boost that I’d made a good decision, so we stuck with the progeny test programme." In the last four years, the Palmers have moved to sire-proving 100% of their herd compared to 80% or less in previous years. New Zealand dairy farmers have been working with CRV Ambreed for more than 30 years to develop generations of daughter proven sires. The elite Holstein Friesian, Crossbred, and Jersey bull calves selected for CRV Ambreed’s progeny test programme ultimately ensure dairy farmers’ herds are competitive and continue to be more productive and more profitable in the future. Andrew says progeny testing gets better every year with enhanced genetics coming into the programme. In particular, milk speed, temperament, and production have improved considerably across his herd. "When we first started with progeny testing, our target was 53,000kg of milk solids, but in our first year, we were already doing 60,000 to 62,000 per year," Andrew explains. "Now we’ve moved our target to 75,000 milk solids per year and the quality of the herd means we achieve this really easily. We could achieve our target by the end of April and dry off. We’ve stuck with it for such a long time because I’m happy with the results," he says. It takes four years for bulls selected for progeny testing to be proven as having the highest genetic gain, based on the production and performance traits of their daughters. These top 15% of bulls feature in CRV Ambreed’s annual catalogue, which thousands of dairy farmers use each year to select the right genetics to meet their herd improvement goals. But Andrew says it’s having access to the best genetics sooner that makes him sign up for progeny testing year-on-year. "We’re a step ahead because we’re getting the animals into the herd three years earlier than those using nominated genetics," he says. "At the end of the day, you need good genetics to get a good cow to produce quality milk. I’m getting as good a cow out of progeny testing as I was getting out of proven genetics."